The bill is similar to legislation passed by the US Senate in 2018, when three Republicans—senators Susan Collins of Maine, John Kennedy of Louisiana, and Lisa Murkowski of Alaska—crossed the aisle and joined Senate Democrats and Independents in a 52–47 vote to preserve net neutrality. (The late Republican senator John McCain of Arizona didn’t vote.) After the legislation passed the Senate, the then-Republican-controlled House never voted on the proposal. Democrats now control the House, but because they lost ground in the Senate during last year’s election, even if the three Republicans who crossed over last year once again join Democrats and Independents, the vote could be 50–50. Vice President Mike Pence would cast the tie-breaking vote. That is, if the bill even sees a vote at all. But let’s say the Senate Dems win over additional Republican support and don’t lose any votes among their own ranks. The bill would still need to be signed by President Trump, who has previously expressed opposition to net neutrality. If the president vetoes the legislation, the Dems would then need to rally enough support to overrule the president’s red rubber stamp. Despite all these hurdles, passing the bill isn’t impossible. The concept of net neutrality has picked up popular support from both Republican and Democratic voters, with some Republicans positioning themselves as supporters of the idea. But many Republican leaders have long opposed net neutrality regulations, favoring less robust, more industry-friendly rules that give the FCC less authority to enforce the protections. 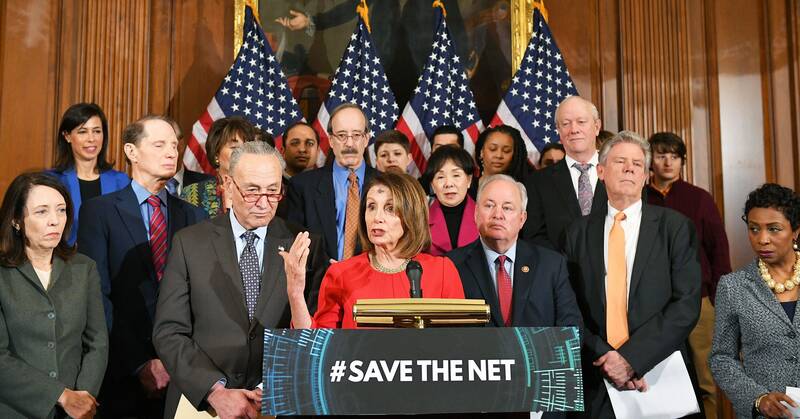 Some legislators are quite strident, like Senator Ted Cruz of Texas, who famously called net neutrality “Obamacare for the internet.” Others try to frame it as a shades-of-gray issue. In 2017, then Representative Marsha Blackburn (R–Tennessee), now a senator, proposed a bill that would ban broadband providers from outright blocking content but wouldn’t stop them from creating paid “fast lanes.” Last month, three different House Republicans announced different net neutrality bills, all of which fell short of the FCC 2015 protections. The most comprehensive net neutrality legislation from the GOP came last summer from Representative Mike Coffman (R–Colorado), who lost his reelection bid. To enforce net neutrality, the FCC had to reclassify broadband providers as Title II common carriers, not unlike telephone service providers. The agency declined to impose all of the regulations that could apply to common carriers under the Communications Act of 1934, but the broadband industry has long complained that the decision gave the FCC too much power. For example, the FCC could have regulated the rates broadband providers charge, though the agency opted not to. Mobile broadband providers began downgrading high-definition video connections on so-called “unlimited” plans before the FCC’s repeal had even gone into effect, but the industry has yet to take any more drastic action. Though that’s probably due to the fact that a federal court is currently mulling the legality of the FCC’s decision to overturn the Obama-era rules in the first place. Passing today’s net neutrality bill would likely render the current court case moot since it would it would restore the old rules and give them a Congressional seal of approval.